Friends of Grassy Waters we want to make you aware of an invasive species in central Palm Beach County, the Nile Monitor Lizard. The City, County, and State are looking for and trying to eradicate them before they become a bigger problem like the pythons in the Everglades. To date, none have been found in Grassy Waters and you can help ensure they don’t make our Preserve their home. These semi-aquatic African reptiles, can grow to 5 feet long and weigh up to 15 pounds. They probably came here through the exotic pet trade, and eat native wildlife and pets. Nile monitors in Palm Beach County have been found along part of the C-51 canal and adjacent waterways. They often burrow in the side of the canal slopes. 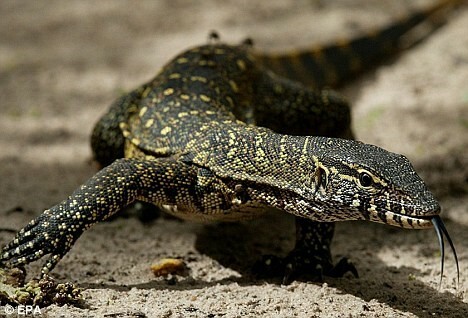 Below is a photo of a Nile Monitor. Their skin color is from light yellow to dark olive or brown, with yellow markings on the back. There are game cameras in the Preserve looking for them, but you can help too. If you think you see a Nile Monitor please send an email to info@grassywaters.org with the date, time and location. Please be as specific as possible, and if you can take and attach a photograph. Do not get to close as Nile monitors can be aggressive. If you have any questions please email info@grassywaters.org.